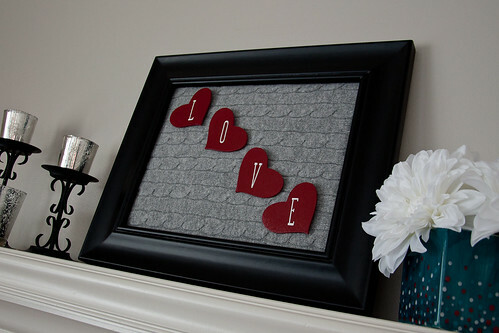 For last year's Valentine's Day shelves I put out family wedding photos. 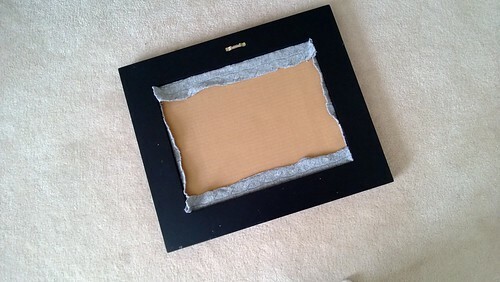 While I liked that concept, I don't wish to try it again until I can replace or paint the frames. 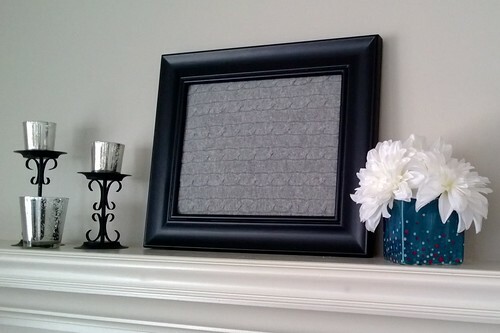 Since my goal was to get this mantel done during one snow day nap time, I knew the wedding photo frame project was out for this year. 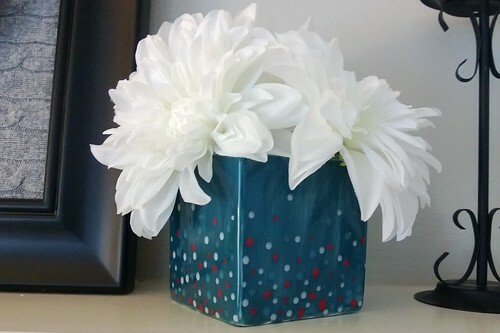 However, after I spent a good chunk of that a snow day nap time arranging and rearranging a few Valentines-ey items (including the above vase that I painted at one of those paint-your-own-pottery places back in August), I came to the conclusion that some minimal crafting was in order. 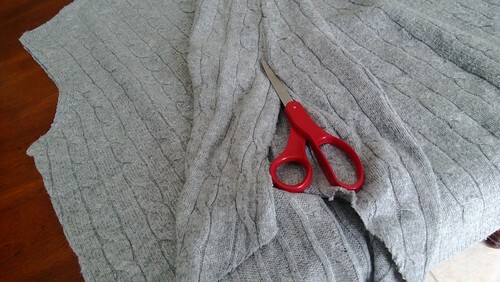 To preserve their potential to be easily sewn into pillows one day, I cut off a sleeve from one of Mike's old sweaters and cut up the middle seam. Don't worry, this is one of several sweaters he handed off to me long ago, this one having grown wider and shorter over time as sweaters tend to do. Someday I'll make those sweaters into pillows...or Christmas stockings...or vase covers...or...you can see why they were still sitting untouched in my fabric bin. 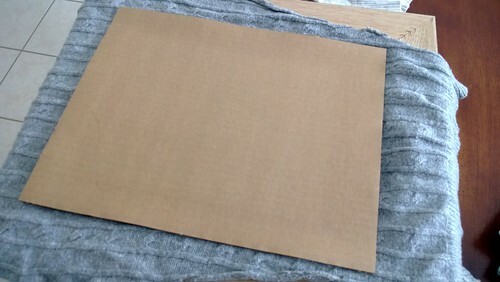 I used the cardboard backing from the frame as a guide and trimmed around it leaving at least .5" around the edge. Tugging the the fabric here and there, I made sure to get the cable knit lines straight. 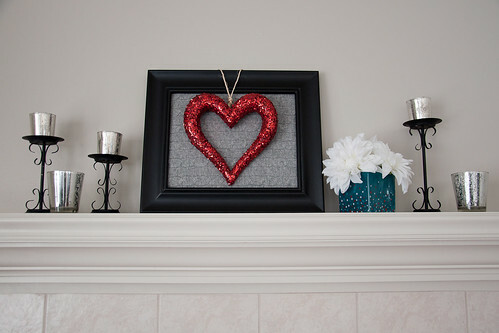 ...adding that heart made our first Valentine's Day mantel in our new house complete! Except it seemed a little out of scale for the fame. The ruby-red slipper glitter was also more sparkle than I tend to use, so I swapped that out for the letters from one of last year's crafts to tone it down a tad (I just stuck them on with tape). Is it bad that when Mike noticed the sweater fabric and teased "Is that because it's a symbol of your loooooove for me?" that was the first time the symbolism occurred to me? Crazy, because now it strikes me as all warm and husband-like and swoony. Happy accidents! 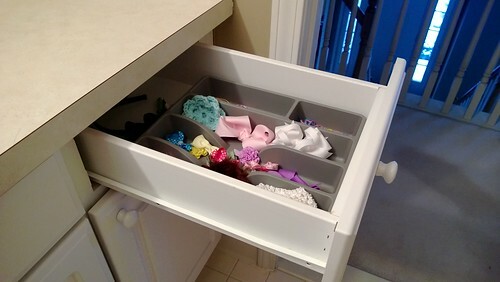 In what now seems to be the third installment of a Pinterest and Ikea organizing series, here is a simple bathroom drawer organizing idea. Years ago I became grossed out by the idea of keeping toothbrushes out on the counter in the bathroom. To me that's like eating a sandwich that sat out exposed in a bathroom while one person after another pooped and flushed and peed and flushed and spashed germy water all over the place. I wouldn't eat that sandwich, and I wouldn't let my kids do it either. 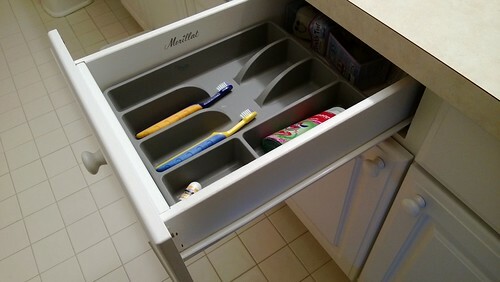 Anyway, because I'm weird about that, in the old house we kept our toothbrushes in the medicine cabinet, but now we have drawers the right size for cutlery trays. 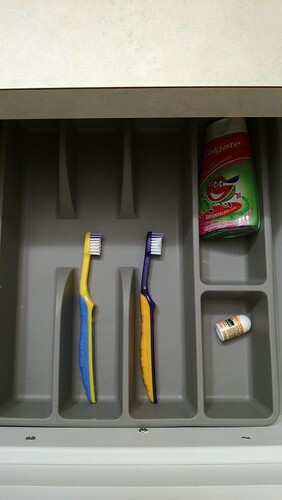 There's space for toothbrushes, toothpaste, and "kissy-face" (Chapstick) for the kids to access easily. 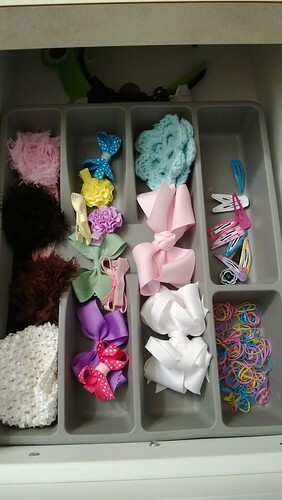 I used the same kind of tray for Sophie's hair accessories. So simple! I've come to the conclusion that no jewelry box or other store-bought product out there has the space for the long and chunky necklaces we gals wear these days. Therefore I've been interested in a well-organized jewelry wall for a while, and the space around our closet door recently became my focus for this project. I used IKEA hardware to create a necklace holder. 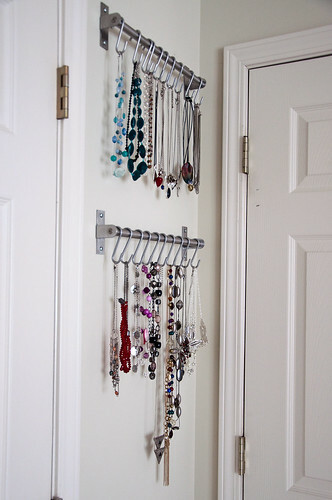 I found a lot of rod and hook system ideas for necklaces online, some using curtain rods, shower curtain rings, and so on. Most photos I found through Pinterest and Google did not link to the original source, but here's one that did. For the space I have available, I chose to get two of the 15" GRUNTAL rails from Ikea ($7 each) and some BYGEL S-hooks ($1 for 10 but needed to be pried open a tad to fit on the rod). I think I'll get one more rod and pack of hooks the next time we're at Ikea as I had to double up a bit and want some room to grow. Even as it is, so far this system looks and works great and is conveniently out of the reach of little hands for now. There's certainly room for that additional rod below these, and I'm thinking of framing some lace or burlap as an earring organizer to hang on the left side. I'll keep you posted! 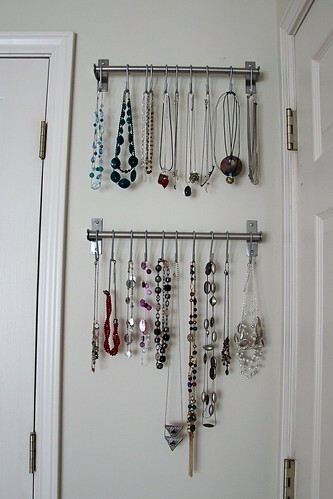 I love my IKEA hardware necklace organizer. I'm not sure if I should be relieved or disappointed that I planned a wedding and had babies before Pinterest entered my life. 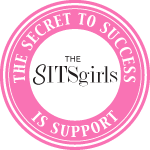 Knowing how much I relied on message boards and blogs for ideas and support for both, I know pinning would have entered into those experiences had I recognized the possibility. I have, however, bought a new home that begs for DIY remodeling and creative organization in the age of Pinterest. "Pinspired" by Ana White's design and others like it, for example, we turned our hall linen closet that already had some shelving into a laundry organizer. Our big laundry baskets from the old house didn't fit in the shallow closet shelves, but I found that Ikea carries smaller ones, the $4.99 BLASKAs. They are actually the perfect size for a load as we tend to load baskets with as much as possible. That was $40 well spent. We store our sheets on the top shelf, and the clothes steamer, iron, and ironing board to the side. 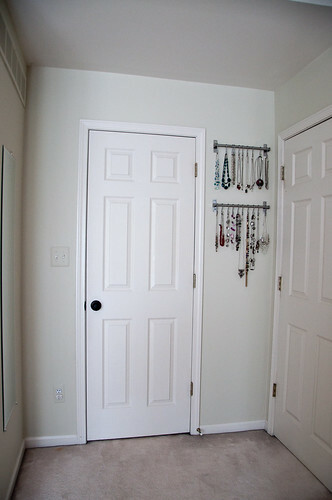 We keep our towels and all other items that might otherwise go in a linen closet under our bathroom sinks. As one might predict, I labeled the baskets. 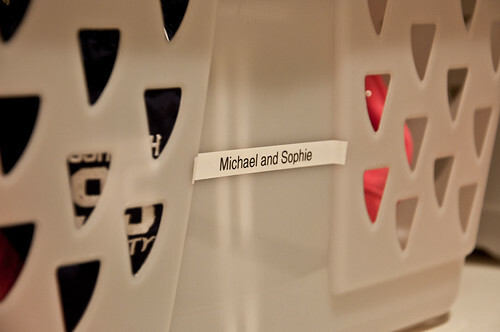 I waited a couple of months to see what our loads tend to really be, and we now have a basket for Mike, Carrie, Sheets, Michael and Sophie, Dry Cleaning, Delicates, White Towels, and Colored Towels. Clearly we do laundry primarily by person rather than colors, but that works fine for us. 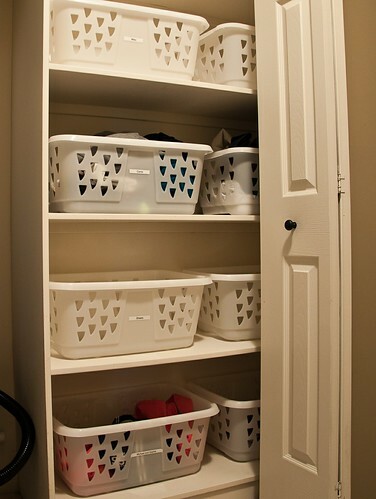 The kids have easy access to the closet as well and know where to put their dirty clothes. 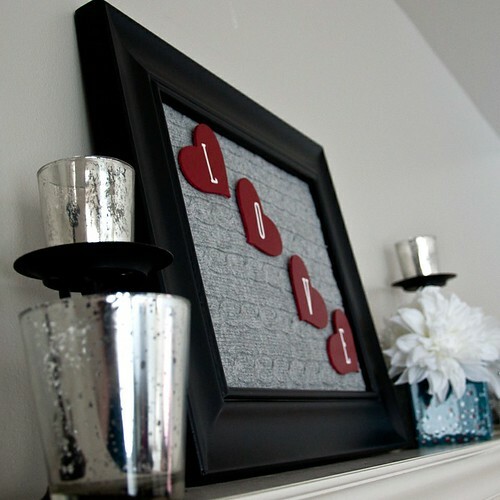 Of course, if you wish to do this but don't already have shelves in a closet, this project would require a little more time and money. I would probably look into putting one or two $15 HYLLIS shelving units in a closet. These baskets would stick out about four inches off the front, but that could still work, I think. Our system keeps the laundry routine moving smoothly--if a basket is full, throw it in--and with little accumulation around the house, it's exactly what I hoped for! 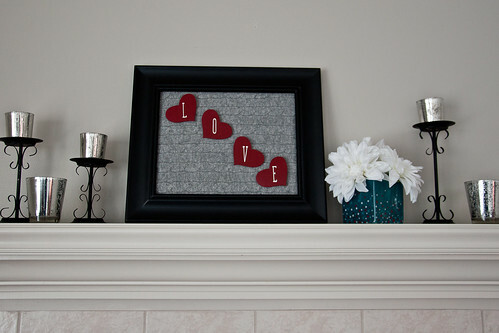 I linked up to Love of Family and Home. 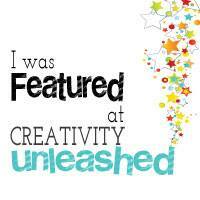 Go check out some more inspiring projects!